I hope you enjoy learning about the range of classes available. This is our basic programme and we occasionally add or offer one-off events. All classes are designed for beginners but of course, the more you do, the more confident and dexterous you become. Sign up to our newsletter so that you don't miss out on any updates. If there is a class here that you would like to do but do not see on the calendar as yet, please let me know. I can then use this information to plan my forthcoming events. This 5-week series is designed to give you a comprehensive introduction to the basic skills of bookbinding. We complete four different structures - case bound, quarter bound, concertina and stab stitch - as well as a lined slipcase in which to store your 'prototype' collection. The styles are carefully chosen so that they each represent a finished project or can be ‘mixed and matched’ to provide a myriad of creative results ensuring you are never again short of a notebook or gift! You finish with your own beautiful collection to use or to refer to as you practice your new skills. All equipment and materials will be provided along with step-by-step demonstration and practice. As far as possible, we use easily available tools and materials so that you can put your learning to immediate use but pre-prepared kits will be available should you wish to avail of them. An alternative or addition to the more traditional books above, this 5-week programme explores four more beautiful and versatile structures as well as more advanced box-making. All equipment an materials will be provided along with step-by-step demonstration and practice. As far as possible, we use easily available tools and materials and pre-prepared kits will also be available. You will leave each class with your own unique book along with the skills and instructions to recreate the same project at home ensuring you are never again short of a notebook or gift! In this workshop we take it a step farther and, on the basis that if you can do three, two is a doddle, you will leave with a 'tres-a-tres' and also be able to do a dos-a-dos! During this one day class we use a mixture of demonstration and practice to ensure that you finish the day with a completed quarter leather raised bands book. A stunning book and skills that you can transfer home if you wish. As a general rule, we use locally sourced hand marbled paper to compliment the leather. Payhembury Papers are international suppliers of beautiful marbled papers and are based in Pampisford. The class is suitable for beginners and it is recommended but not essential that it is combined with the hard backed case bound journal (either the one day class or Beginning Bookbinding). During this one-day programme you learn the basics of paper and page repairs using a variety of papers and tissues. The morning starts with paste preparation and demonstration of a number of paper dying processes. This is followed by deconstruction of books (where necessary) in a safe and sympathetic fashion after which page and signature repairs can be done. We also practice repairs in-situ as well as learn how to fill holes and repair tears amongst other things. Our aim is to prepare the book(s) ready for re-sewing. The class is taught through some demonstration but mainly through guided practice and participants are encouraged to bring along a number of books in need of page/paper repair. Designed for beginners. This beautiful 20cm x 15cm album will hold up to 40 single 5x7 photographs on 20 acid-free pages (black or white). You can choose one of our marbled papers and use a matching bookcloth or you can make a fully personalised book by bring your own paper. If you have a fabric you would like to use, please email me and we can discuss viability. The finishing touch will be adding an occasion, date or personal name to the cover. A treasure! Most classes teach techniques for binding a number of sections of pages into a book but of course there is often the need to bind single pages too. 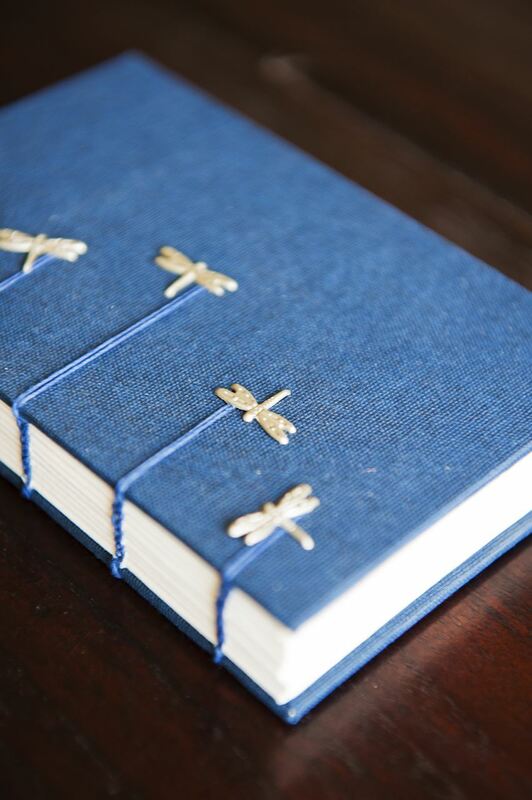 During this workshop you will learn how to stitch single pages into a decorative book form. This book lies flat when open and is popular amongst other things as a scrapbook or an artist portfolio. once you've done this class it will be possible to bind anything 2-dimensional into a book form - tiles, slates, sheets of perspex or balsa wood; even paper! This binding is one of the earliest 'book' shaped bindings dating back to China in the century. Today, these books are used as sketchbooks, notebooks and, with a little extra reinforcement, albums or scrapbooks. During this workshop you will learn one of the four stitch styles used in traditional Japanese bookbinding. These are beautiful structures to which you can add a variety of creative finishes. You can also design your own stitch patterns! The traditional labelling is a technique which can be transferred to other books. The historic and beautiful 'coptic' binding is a very popular class. The binding allows the book to lie perfectly flat and also to open to 360 degrees, making it popular amongst other things as a journal, travel book or artist sketch book. Also, the exposed spine stitching has enormous visual appeal.